In 1808, Sequoyah began working on a system to write the Cherokee language. He worked in secret. Some people thought he was crazy. Others thought he must be practicing sorcery. Finally, in 1821, he perfected his syllabary, a symbol set with one character for each sound in the language—86 of them. He went to the home of his cousin George Lowrey to demonstrate his invention. When Lowrey expressed skepticism, he left. The next day, however, Lowrey went to Sequoyah’s cabin. Sequoyah sent his six-year-old daughter, whom he had taught the syllabary outside. He had his cousin dictate something to him, which he wrote down in his system. When the little girl returned, she read back Lowrey’s words exactly. George Lowrey became the advocate for the syllabary, and the Cherokee National Council adopted the system officially in 1825. It is the only indigenous writing system north of Meso-America. Around the time that the Cherokee National Council adopted Sequoyah’s syllabary, he migrated from his home in the East to the Arkansas Territory, where he established a blacksmith shop and salt works. Cherokees had been emigrating west since 1793. Some were in Arkansas and others were in the Texas region of Mexico. These early immigrants became known as the Old Settlers. 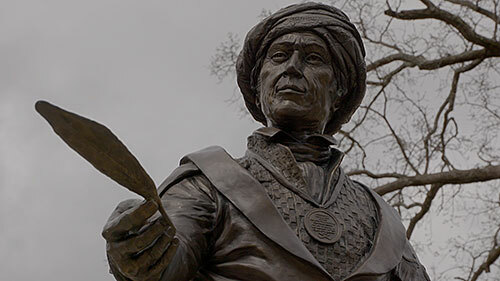 Sequoyah became a leader of the Old Settlers, and his writing system provided an easy way for them to communicate with their relatives in the East. In 1839, the Old Settlers in Texas, under Chief Bowles, came into conflict with the recently independent Texans. Bowles was killed. Most of his band went to Indian Territory to join the newly removed Cherokee Nation. Some went to Mexico, in which they had always felt safe. One of Sequoyah’s sons had married Bowles daughter and was presumed among the Mexican contingent. In late 1842, Sequoyah set out on foot to travel to Mexico, in the hope of persuading the Cherokee there to come back with him and reunite with the Cherokee Nation. Although he and his party successfully reached Mexico, he never returned home. There is only circumstantial evidence concerning Sequoyah’s death. Some accounts say that he died in Mexico among the Cherokee and was buried there. In 1903, a skeleton was discovered in the Wichita Mountains of Oklahoma. Physical evidence strongly indicates that it may be Sequoyah’s. Did he perish on the return journey to his home in Indian territory? Today, a modern “Sequoyah” is restoring the gift of the original to his people. John “Bullet” Standingdeer, with the help of a white anthropologist, has invented a system to teach Cherokee, a notoriously difficult language, that replicates how native speakers learn, using in part Sequoyah’s syllabary. Along with other modern innovations, Standingdeer’s system is helping revitalize the Cherokee language.